Fishing Battery Light was constructed as a integral one-story brick house with a wooden rooftop lantern built by John Donahoo in 1853 and contained a sixth order Fresnel lens. This was the last lighthouse constructed by Donahoo on the Chesapeake Bay and one of the last lighthouses ordered by the Pleasonton administration. The light is located on Fishing Battery Island, just over three miles south of Havre de Grace and the entrance to the Susquehanna River. In 1887 the lighthouse went through major renovations with a new foundation and an enlarged building. The ground floor was converted to a storage area for a boat and other items. The second floor was used as the keeper’s quarters. In 1921 a steel skeletal tower was erected next to the lighthouse and the light was moved out of the rooftop lantern room. Keepers continued to live in the lighthouse until 1939 when the light was automated. It continues to operate as an aid to navigation. In 1942 the island came under ownership of the Department of the Interior and is considered part of the Blackwater Wildlife Refuge. The lighthouse can be seen offshore, 2.5 miles from Swan Creek Point. It is best seen by boat as the site and tower are closed to the public. The abandoned lighthouse is now on the Lighthouse Digest Doomsday List of critically endangered lighthouses due to neglect and vandalism. 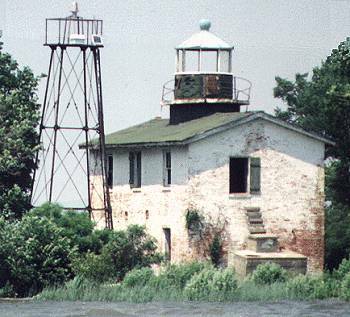 The Chesapeake Heritage Conservancy along with the Havre de Grace Maritime Museum, are seeking the funds needed to save and restore the lighthouse. Some of these maps are large in size and may take a minute or two to load.